RIO DE JANEIRO: Argentina midfielder Javier Mascherano said the pain of losing the World Cup final in extra time to Germany on Sunday would live with him forever. Argentina played extra time in three of their four knockout games and also had a day less to rest ahead of the final than the Germans after squeezing past the Netherlands on penalties in the semi-final on Wednesday. And the 30-year-old said they ran out of steam in the second-half of extra time when Mario Goetze struck the winner seven minutes from time. "It is difficult to explain. It escaped from us at the last minute, we did everything to try and win. We had the best chances until we ran out of gas. 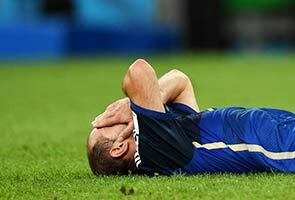 "The pain is immense because we wanted to take the World Cup back to Argentina but we gave everything. We are empty, we gave what we had and we are sorry for ourselves, for the people that came here and for the people that are in Argentina. "Football is like this and we have to raise our heads and deal with the pain." Argentina also had claims for a penalty turned down early in the second-half when Germany goalkeeper Manuel Neuer dangerously charged into Gonzalo Higuain with his feet raised. However, Mascherano graciously played down the part played by Italian referee Nicola Rizzoli played in the final outcome. "These are plays that happen in football. The referee didn't influence the game at all." Mascherano was included amongst the top 10 players of the tournament after a series of stellar performances, but he insisted he was prouder to have been part of a fine team effort in taking Argentina to their first final in 24 years. "This is a sport where the team matters not the individuals" he added. "We can leave with our conscious clear knowing we gave it our all. "We were up to the task of what a game at this level demands. We gave everything we could, but we just lacked that little bit of luck you need in a final, which they had." Manchester City defender Martin Demichelis was one of a backline who excelled in going 486 minutes over five games without conceding until Goetze's late strike. "It is a great, profound and immense pain," said the 33-year-old. "I think it was worth the effort to lose with our head held high and dying on our feet. It was a great game against a great champion in Germany. "We only thing we failed on was that last attack they scored from." However, goalkeeper Sergio Romero believes there is the core of a young group within the squad that can look ahead to next year's Copa America and the World Cup once more in four years time with some confidence. "We hope that in the future the national team continues to be what it is and that is a great team. And that in the base we have now, we can build for the future. "Football offers up revenge all the time. We need to focus again on the things we did well and can repeat and what we did badly so we can improve"